There is a frame that has popped up with some decent Campy componentry which I am thinking about buying. Any idea of when this was built and where? Thinking of bikes with a G, Gucerotti, Gitane et al, can't find an exact match with the logo. 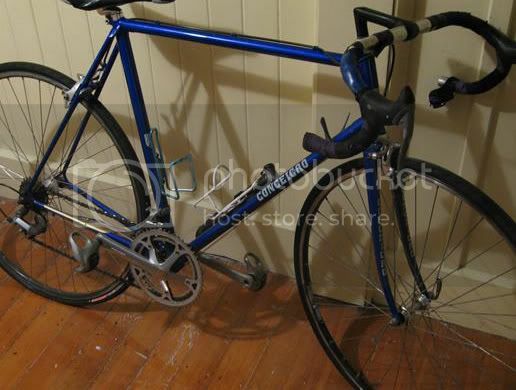 Also found a Colnago Saronni frame in okish nic for a steal (see next post from me)! bumping as the G in the spade seems very familiar to me, must be an instant sign for someone who knows? Thanks again to anyone with any idea here. Looks like a nice bike. 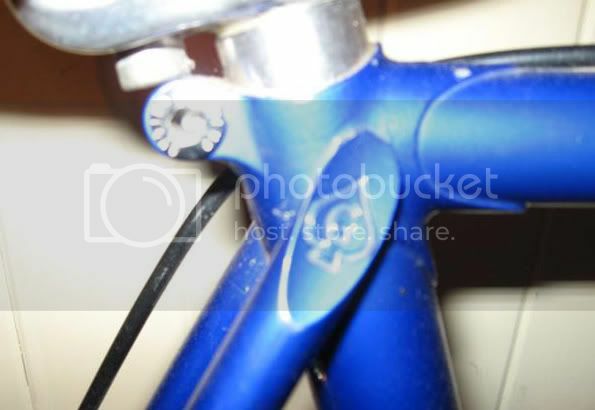 I've run across a lot of Italian "no-name" bikes on eBay; good tubing, nice lugwork, etc. but no history on them at all. Looks like mid-80's Columbus SL bike. There is Grandis, Gloria - it is neither of those. I would like to see more photos of the lugwork, stay bridges, bottom bracket etc. Looks very interesting. Just guessing but I'd say it's exactly what it says it is. I'm guessing those are G's in the name, so the G stamp in the heart makes sense. Gongeigro? Looks like a low volume high quality bike. Thanks for the replies, thoght the G in the spade was familiar, looks nice anyhow and if i get it for the right price I say why not. it looks like a fine quality frame, and one I've never seen before. The spade with a "G" is familiar looking, but not familiar: it's not a Confente, probably not a Colnago rip-off either, but it seems to be well made. Most likely a very small-output builder or something made for a shop or distributor as a "house brand" by somebody who knows how to build. Probably you can't go wrong, especially if it's another $20 Aussie bargain. Conceicao = Frank Conceicao, framebuilder and owner of Albion Cycles, Sydney, Australia. The G/spade logo = Gefsco = Geoff Scott, framebuilder for Clamont, Gefsco, sometime Bundy builder, sometime Trek builder, with a very long Australian history. Wow! 10-year-old thread gets a massive boost! Thanks. I enjoyed the veloaficionado link. Mr Scott builds some very nice bikes. Jim, would I be out of line to say Lennie Rogers also built frames for Mr Conceicao? I seem to recall I read that somewhere recently. bravo! worthy of Maurice Moss and some other C&V sleuthing worthies! Purely for future generations. A wise woman once said "I believe that children are our future, teach them well..."
Dunno. He may have. Frank is still working, I might be dropping in to ask him about one of his frames soon so I'll check. and for 10 years I was certain it was a Golnago. Oi!, Oi!, Oi!......An Aussie boyk eeet eees! Do they wrap their tape the opposite way down there? No, we just thread everything on backwards and hope it stays in place.